Enlisting the support of your employer before you commence your MBA is a smart strategy. It can be helpful for your manager and colleagues to understand your study commitments, but more than that, communicating the benefits of an MBA to an employer can create career opportunities for you and even improve their bottom line. Some workplaces will even provide sponsorship or study leave for professional development that is relevant to the business. An online part-time MBA is the most achievable model for busy working people. Online study is very flexible and allows you to continue full-time work, without having to travel to attend classes with no impact on your work hours. Talk to your employer about your vision for the organisation and how you see yourself bringing value on a long-term basis. Demonstrate your loyalty by sharing specific ideas about how you intend use your MBA knowledge to improve outcomes. By supporting you in your studies, your employer will develop an ‘asset’ for the organisation: a future leader with unique strategic, analytical and financial skills to help take the organisation forward. The Victoria University (VU) Online MBA has a huge focus on career-based learning. From improving business models to better financial management, everything you learn online is designed to be immediately applicable to your work. Assessment tasks provide you fantastic ‘real-world’ case studies to engage with and invaluable insights for your employer. Starting with a business plan in the very first unit and ending with the final major project, your assessment tasks are relevant to your working life. And don’t forget; you will be getting personalised feedback from facilitators and academics who are experts in their field, which of course you will be passing on to the business. Our broad MBA will teach you to look at your organisation from a ‘big picture’ perspective and equip you for a broad spectrum of current and future leadership roles. The course covers a range of disciplines and how they operate in the global business context, including financial analysis, human resources and marketing. Understanding challenges across all parts of the business will strengthen your decision-making and make you a stronger leader. Of course, knowledge alone does not create an effective leader. VU Online’s MBA explicitly develops you into a strategic leader who can achieve organisational goals by influencing people within and outside the organisation. You will practice the complex skills of scanning the business environment and setting direction. You will assess your own leadership abilities, be coached to demonstrate accountability in decision-making, and create a plan to develop your personal leadership style. Studies in Performance Management and Rewards will support your leadership capacity. Your MBA will connect you and your organisation to new perspectives and industry contacts. Our collaborative learning community will expose you to cutting-edge ideas, expertise and debate – and provide rich networking opportunities. Through our online learning platform, VU Collaborate, you’ll have access to industry leaders and highly qualified academics, many of whom come from corporate and industry backgrounds. Furthermore, your student cohort will include successful business people, entrepreneurs and future leaders. Our online study groups, chat sessions and interactive seminars allow you to learn from others and prototype your ideas in a supportive forum. You will be able to lead your organisation through change. In every unit, you are taught to think strategically about the current business environment, but also to anticipate and lead change. With MBA units in Strategic Management and Business Policy, Organisational Change Management and Managing Innovation and Entreprenurship, you will build knowledge of business practices and theories. More importantly, you will learn the analytical skills to create opportunities from emerging challenges. Completing your MBA online equips you with the skills to thrive in our increasingly digital economy. 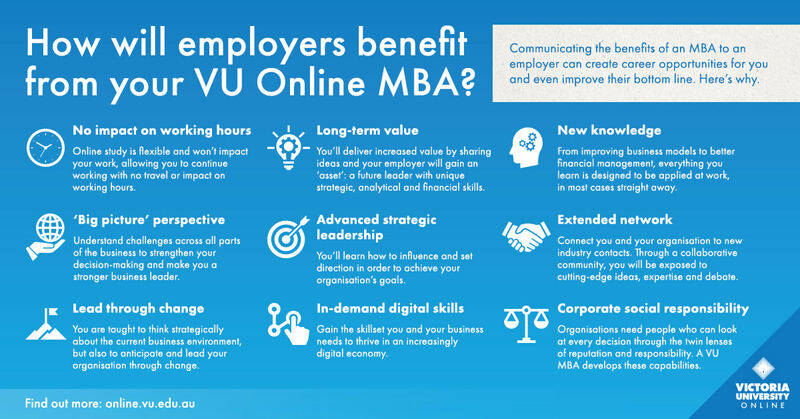 VU Online’s MBA has a strategic focus on digital literacy, with every task requiring you to embrace technology and consider new ways to operate in the online environment. If your organisation is struggling to adopt a digital mindset, talk to your employer about how the MBA will help you move the business forward. Another crucial dynamic in today’s business world is reputation – and the many factors that influence and protect brand identity. In our Business Ethics and Sustainability unit, you will apply your decision-making skills in the context of corporate responsibility – and practice organisational responses to social issues. What's more, you will become adept in current and emerging marketing practices in our Marketing Management unit. Whatever part of the business you operate in, your organisation needs people who can look at every decision through the twin lenses of reputation and responsibility. Talk to your employer about what skills they need and how you can support their vision for the future. Together, you will be able to harness the MBA to not only your own advantage, but that of your employer as well.